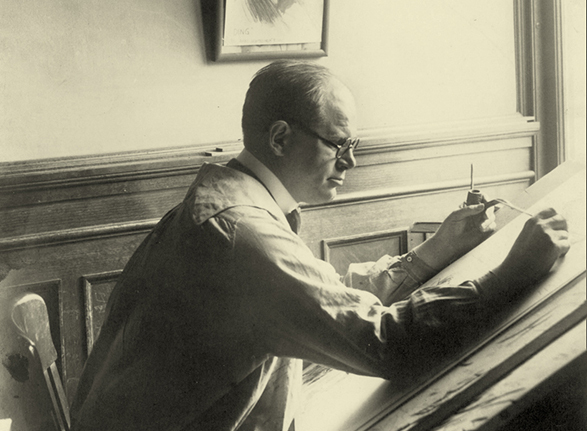 A new exhibition opening at Drake University examines the life and work of honorary degree-holder Jay N. “Ding” Darling, a two-time Pulitzer-prize winning political cartoonist and environmental conservationist. The exhibit was curated by nationally recognized Darling expert Sam Koltinsky, a documentary filmmaker who serves as director of the Jay N. Darling Center in Des Moines. The exhibit will be complemented by a series of panel discussions by journalists, historians, conservationists, and scholars. Darling received an honorary Doctor of Laws degree from Drake University on June 2, 1926. The exhibition will feature a photograph, recently uncovered by Drake archivists, of Darling in his cap and gown, honorary degree in hand, on the day of the commencement ceremony. 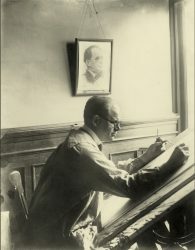 Some additional display materials will be drawn from Drake University’s Archives and Special Collections, which hosts a collection of more than 6,000 editorial cartoons completed by Darling between 1914 and 1948. 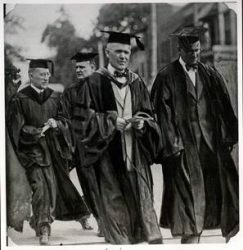 Jay N. “Ding” Darling (far right, with round glasses) was awarded an honorary degree from Drake University Law School in 1926. Wednesday, March 28. Exhibit opening and reception, featuring presentations by Sam Koltinsky, director and curator of the Jay N. Darling Center; Joe McGovern, president of the Iowa Natural Heritage Foundation; and Brian Duffy, freelance cartoonist and illustrator and former front page cartoonist for The Des Moines Register. Thursday, April 5. “A Conversation with Nature,” presented by Drake University Associate Professor of History Amahia Mallea, Assistant Professor of Environmental Science Peter Levi, and Professor of Biology Thomas R. Rosburg. Thursday, April 19. “What ‘Ding’ Might Say,” featuring presentations by Dennis Ryerson, former editor of The Des Moines Register and Neil Hamilton, professor of law and director of the Drake University Agricultural Law Center. Thursday, May 3. Presentation by a representative from the U.S. Fish and Wildlife Service (to be announced). All events begin at 7 p.m. and are free and open to the public. More information is available at library.drake.edu/ding-darling. Jay Norwood “Ding” Darling was a leading editorial cartoonist in the 1900s, first for the Sioux City Journal, then for The Des Moines Register and Leader (later known as The Des Moines Register). At the height of popularity, his work was syndicated to 150 newspapers in the U.S., and he received Pulitzer Prizes in 1924 and 1942. An avid environmental conservationist, he was appointed by President Franklin D. Roosevelt in 1934 to a federal position through which he implemented the Duck Stamp Act, designed the first duck stamp, and also founded the Cooperative Research Unit Program. He was also instrumental in the formation of the National Wildlife Federation. Sanibel Island, Florida, is home to the Jay N. “Ding” Darling National Wildlife Refuge. The Jay N. Darling Center’s exhibition has been traveling for about 4 years—most recently, it was on display at Sioux City Museum in summer 2017—and has been growing steadily throughout its lifespan. In fact, the exhibit originally featured 7 pieces of artwork.